An enjoyable short winter outing, easily accessed from the Clova Hotel. It provided impressive views of the two corrie lochs of Loch Brandy and Loch Wharral, and down Glen Clova, an area rich in scenery left by glaciation. The most memorable aspects were the impressive views down to Loch Brandy, and later across the corrie containing Loch Wharral. The worst bits were the tricky climb up the gully on Ben Reid (although this can be avoided) and the bitterly cold north wind. The funniest bit was when our legs sank several feet in a deep patch of snow where we stopped for lunch. A word of warning to others is to take care if climbing the rocky buttress on Ben Reid. For those of a nervous disposition, this was a scary bit, getting higher on a long continuous slope. 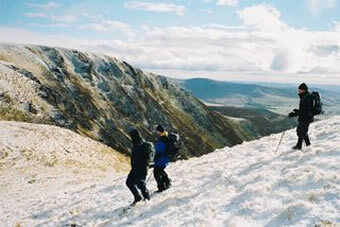 Some care is also needed close to the edge of the corries, but the tops of the hills provide easy hiking in clear weather.